Otto de Kat (the pen-name of Dutch publisher Jan Geurt Gaarlandt) did not publish his first novel, A Figure in the Distance, until he was 52, following it in the same unhurried way his stories unfold with Man on the Move six years later. His age is perhaps reflected in the quiet, elegiac tone of his work, its sense of looking back on a life with a keen awareness of the choices made, though it doesn’t quite explain his fascination with the 1930s and 40s where much of his work is set. 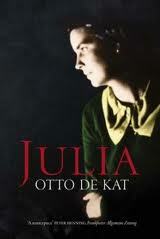 He returns to the pre-war period again in his latest novel to be translated into English by Ina Rilke, Julia. Julia soon loses her job under Nazi pressure and is on the run, with only occasional meetings with Chris. More than once he asks her to return to Holland with him. Eventually they meet for one last time on Kristallnacht when, having spent the night looking for her, he finds her waiting for him. She begs him to return to Holland the next day and he does, without her – and it is this regret that haunts him in the years ahead. Dudock cannot forgive himself for not being brave or strong enough when it mattered. Ultimately, he is too ordinary, and that is what his life becomes: superficially successful but banal. While this is Dudock’s story, it is clear why it bears another’s name: Julia remains luminous to us in this wonderful short novel, while Dudock simply fades away as most of us are destined to do. You are currently browsing the 1streading's Blog blog archives for July, 2012.